First of we just want to simply thank everyone for the amazing feedback on the third gameplay video we’ve received so far. With almost 30000 views and almost 400 encouraging comments in only one week we are humbled by the response. Sadly this is the last pure gameplay video you will get from us but we are confident there are many talented YouTubers waiting to press the record button and start building. Our ambition is to over the coming updates work with more video content and for example replace some development blogs with development vlogs. On the release of the third video we decided to really make use of all those great suggestions that flood our channels and start testing our development processes for publicly collecting and handling bugs. All in all we received something like 80 bugs (some of them were of course duplicated) and we decided to really get to work and sort them out. 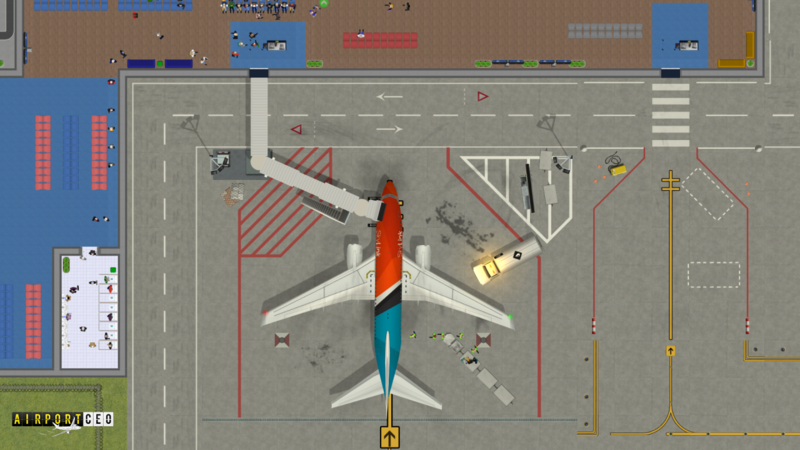 As of now we have fixed the majority of them, which can be seen in this week’s changelog, but we’re really happy to see that we have so many people with good eye sight and knowledge of airport operations around us. As you can imagine, working on a project of this size with over 100000 lines of code for hours and hours on end and when trying to craft something that is detail oriented it is very easy to miss out on perfecting those details. Thank fully, you’re there to point them out. If you would happen to check the first or the second gameplay video again, feel free to submit any bugs or weird behavior you see. The earlier the video is, the more likely it is that whatever bug you’ve found is already taken care of but please feel free to submit it anyway. You can check out the instructions in this forum thread and check out the overall progress in this public bug sheet. We are currently looking into different toolsets for publicly collecting and executing bug reporting as well as feature requests such as Trello and other Kanban project management software. Prior to the game’s release we will launch this platform so that you more easily can keep up to date and weigh in on the development process. Throughout the week we have also, as usual, been running longer tests with maximum capacity in our test airports and we can really see that rigorous work pays off and that the systems more and more are behaving stably as we expect them to. Knowing the challenges of all the complex simulations that are running under the hood it is truly an awesome feeling to just watch the airport operate, flight after flight after flight. We have also been working a lot with a few of the last important subsystems we will attend to before release and this week has been dominated by the weather system. We have overhauled major parts of this system and have re-implemented rain, hail, sleet and snow as well as implemented several new weather states such as storms (rain, sleet, hail and snow), sunny and clear weather, dry, hot, cold and so forth. We are essentially preparing for the weather system to play a major role in the operations of the airport and are currently focusing on implementing the actual simulation of it, i.e. the visual effects and its associated underlying weather generation algorithms. Generating cohesive weather system patterns that make sense is actually harder than one can think and as we are testing the game we are consistently tweaking the numbers determining the patterns. 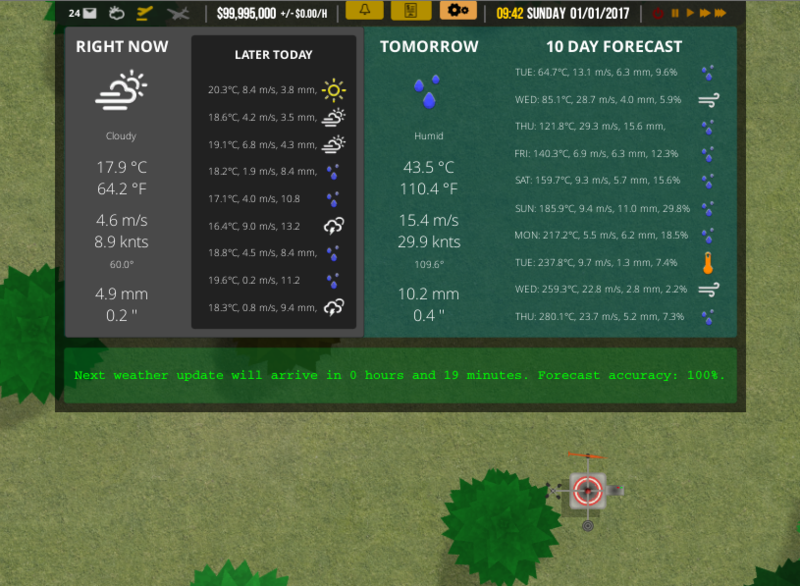 In conjunction with this we also implemented an aspect that puts out sensible forecasts of the generated weather depending on an accuracy factor which could be determined by perhaps the health of your weather station. We have also overhauled parts of the weather panel to fully support all the relevant data displayed as of this overhaul and while it still requires some work it does make more sense today than it did yesterday. Next week we will tackle some difficult aspects of time, finalize the procurement system for upgrades and such, finalize aspects of the tutorial process and continue to polish and tick things off from the backlog. Are you a Redditor and an ACEO fan? Do you want to moderate the ACEO subreddit? If so, please check out this forum topic on how to apply. In other news, we can also happily announce that the newsletter is up and running again and will slowly start to push out the weekly ACEO newsletter. Perhaps you were brought here by it? If it annoys you, don’t forget that you can easily unsubscribe! That is it for this week but as always, if you have an inquires you can find us over at the forum! Fly safe.